When you’re looking for DHI’s, sometimes a simple tool can get surprisingly good results. In the right structure, optical stacking will highlight flat spots and contacts. This workflow generates an optical stack by averaging samples in a direction. It works in time or depth, but it’s best done in depth to avoid velocity effects from shallower intervals. In the Control Panel > Process tab, click the blue "+" button and add a Volume Smoothing process. Type a name e.g. "Optical Stack (inline)". 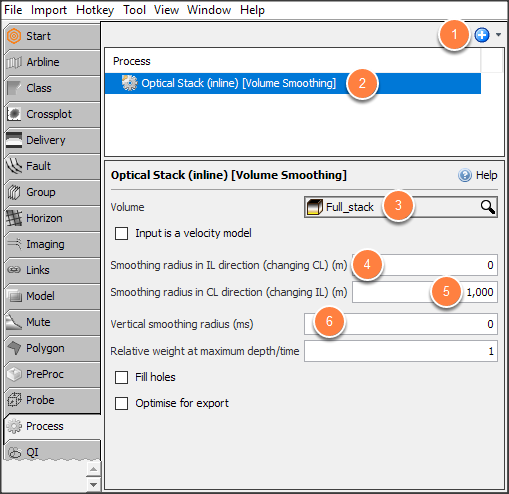 Select the Volume to stack. Note: stacking in IL direction changes CL. Note: stacking in CL direction changes IL. By creating an arbitrary 3D survey, we can optically stack in any direction. We use Volume Resample to project the original data onto a rotated survey. We then follow the same process as above. Create a dummy 3D survey using survey configuration. Match the orientation to the arbline direction. Resample stack data to new rotated 3D survey. Choose stack data and new rotated 3D survey. Add resampled volume as input to volume smoothing process and follow workflow above.